We invite you to call Sarah or Gwen at 1-800-762-4216 to request the full brochure. The brochure will include Important Traveler Information (and answers to most questions) and a Reservation Form. We can send the brochure through the Postal Service or as a PDF attachment. If you would like to receive a PDF, probably the best way to keep the message from going into a SPAM filter is to send a message to sarah@serioustraveler.com. If you are already on our mailing list, no need to complete the entire brochure request form. Charming and energetic are adjectives used to describe the emerging Albania. Once mysterious, this Balkan and Mediterranean country is situated on the coast where the Adriatic meets the Ionian Seas. Our previous spring trips to Albania have been a great success and so, with the encouragement of our renowned host, Auron Tare, we are repeating the program. Our short and sweet trip begins and ends in the capital city of Tirana. Hospitality is a tradition in Albania that dates back to the time of Homer when guests were greeted as sacred. The Kanun or The Code, written in the 15th century, demands the guest be treated with the highest respect. Our small group of no more than fifteen will travel with our experienced archaeologist guide, who will introduce us to Tirana to explore the country influenced by Greeks, Roman, Italians and Turks, all of whom left their indelible marks. We’ll also get an excellent perspective of modern day Albania as it emerges as an unspoiled European destination. Mr. Auron Tare hopes to join the group for part or all of the time, and as founding director, will give you a enlightening focus on Butrint. Auron has recently resigned from Parliament in order to head up a new agency that will manage the entire Albanian coastline. We are quite honored to work with this prominent historian, journalist and undersea explorer. 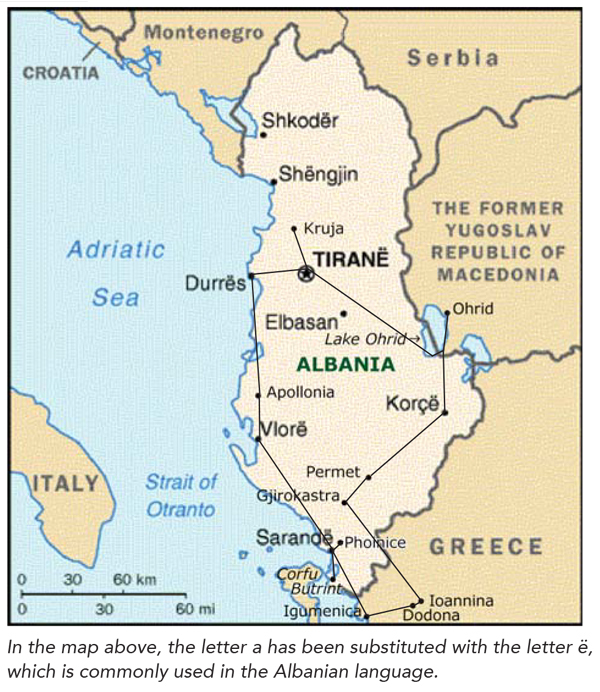 To this extensive look at Albania, we’ve added a visit to Ioannina in Northern Greece, the center of Greek Enlightenment between the 16th and 19th centuries. Also step into Macedonia to see its side of Lake Ohrid with its Old Town and market. We are eager to show you the Balkans in a fresh light with the best guides on the planet.